Is your fridge full of little bowls of leftovers, unidentified things in silver foil? Do you take one look and think it would be easier just to pop out and buy a couple of chicken breasts for dinner? How much money are you wasting on food? 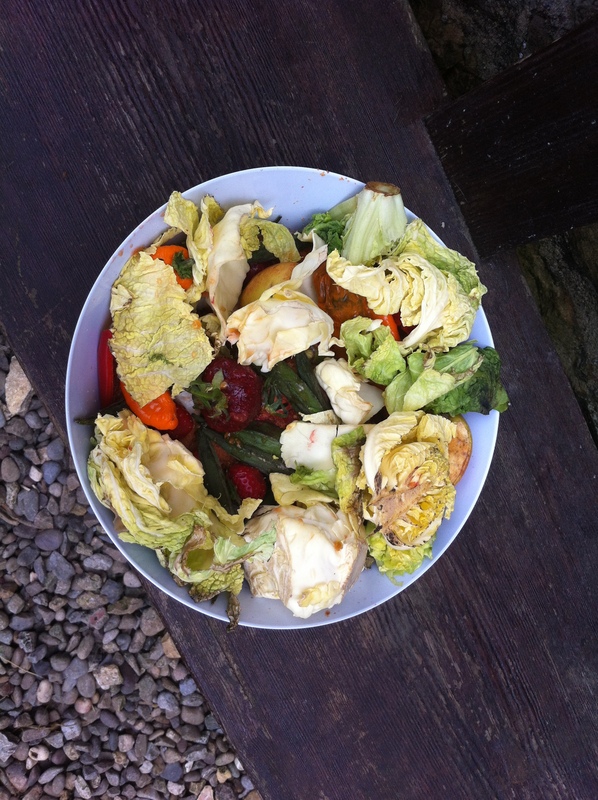 Combine decluttering with the essential post holiday belt tighten and clear out your fridge. Give it a really good clean whilst you are at it (a paste made from water or water and vinegar and bicarb is an excellent cleaner and gets rid of any unwanted smells). 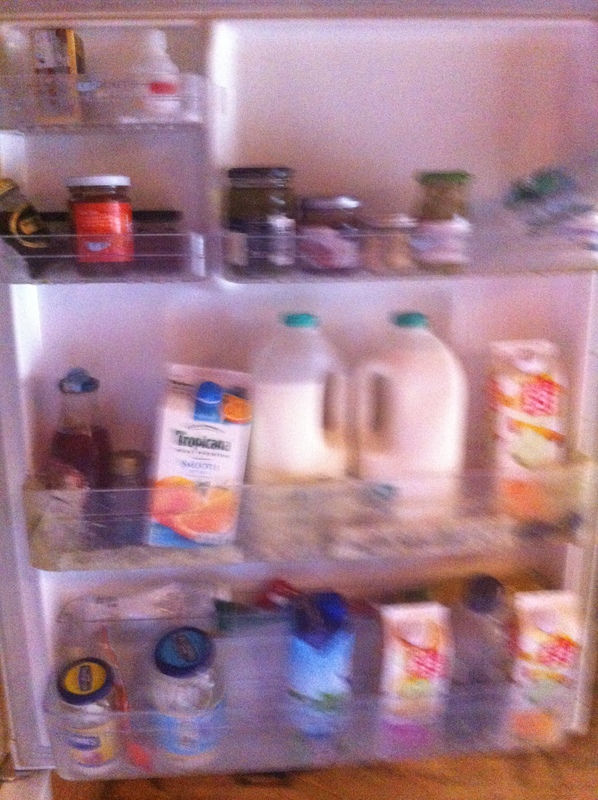 Put back all the regular essentials (milk, butter, fruit juice etc.) and have a good look at what is left. Divide it up into OMG how long has that been there , it is no longer recognisable as food, and the rest. You can chuck the former. This is the only time you will do that. 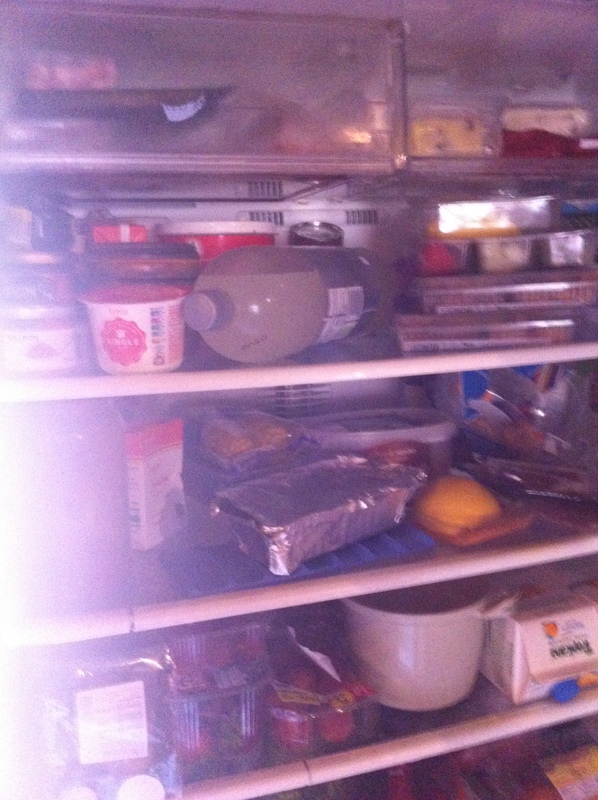 From now on there will be no more UFOs (unidentified food objects) in your fridge. The rest needs to be sorted into what you have to eat fairly quickly, the open packet of bacon for example and what can hang on for a while yet, that hard heel of cheese. Take the first group and work out what you could cook with them. 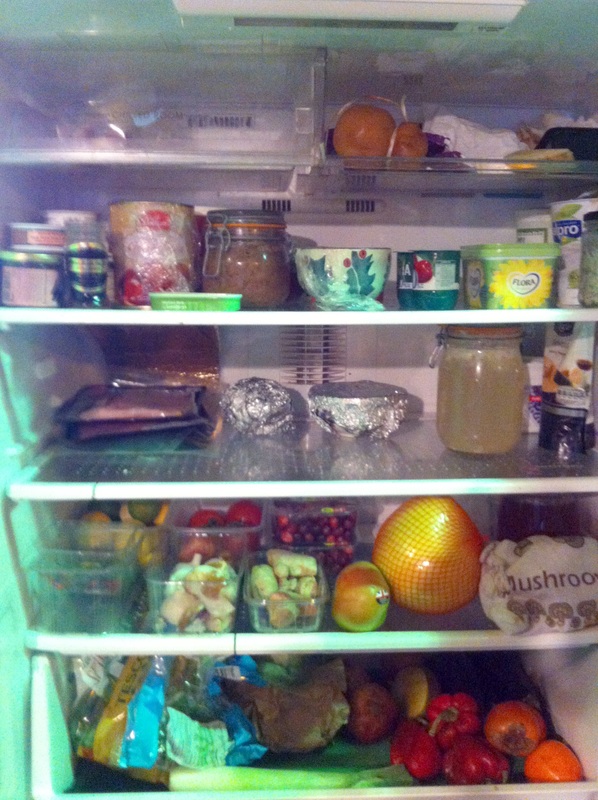 I tidied my fridge after the Christmas holidays, it was full of bits of leftovers and was driving me nuts. The last bits of cooked ham, some cold boiled potatoes, some rather dried out sausages and the end of homemade terrine (ie I knew what was in it) was chopped up and added to the butchers scraps and cooked up for the dogs. We had crunchy topped cheese and squash bake using only leftovers from the fridge. 1 elderly and slightly worse for wear squash, 1 bowl of dried breadcrumbs, the remains of a pot of creme fraiche, the open packet of bacon and all the left over and rather hard heels of cheese from the holidays. It was delicious. If you really can’t think of what to cook with your assorted ingredients then hit the internet. “Cabbage and cranberry recipes” alone brought up pages and pages of recipes. So now you have tonight’s supper sorted you can put those ingredients to one side and look at the rest. Again sort them into order of decay – i.e. use the ingredients that will last longest last. Hey presto! You have cleared your fridge AND written a menu plan for the next few days and you haven’t even spent a single penny. 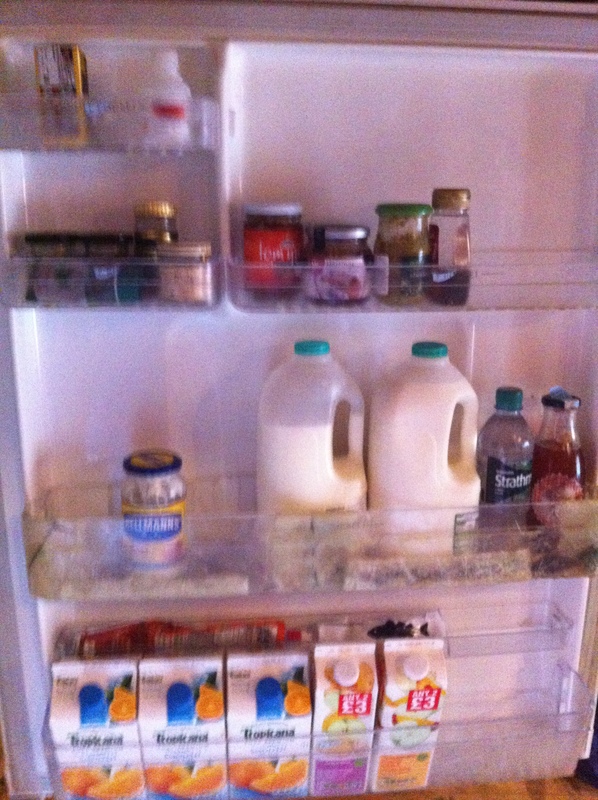 If you are feeling brave you really ought to combine a fridge clear with a freezer clear. With careful jiggling and swapping of ingredients you can take the hassle out of “what are we going to eat tonight”, save a fortune on groceries and find order in your kitchen. What’s not to like? I plan menus every week, it makes life so much easier and cheaper. I don’t subscribe to the 15 (or whatever) circulating recipes. How boring that must get. Instead I start my shopping in my pantry and freezer. Then I get out 2-4 recipe books and look for new recipes to try using the major ingredients I have found on my “in-house shop”. I have planned every meal this week without having to purchase a single ingredient. Last night we had pan fried steak and cranberry sauce using the left over cranberries and two rather small steaks from the freezer. We are a family of five so cut the steak into strips after I cooked it, laid it over a mound of mashed potato, poured the sauce over the top and added lots of veg. Once you have your recipes allocate them to days of the week, taking into account any evenings where you will have to serve at different times to accommodate other people’s commitments or will have little time to prepare. Baked potatoes and pasta (not together!) are our” no time to faff in the kitchn”meals. The shopping list is made on the basis on the ingredients I need which are not in the pantry or freezer. 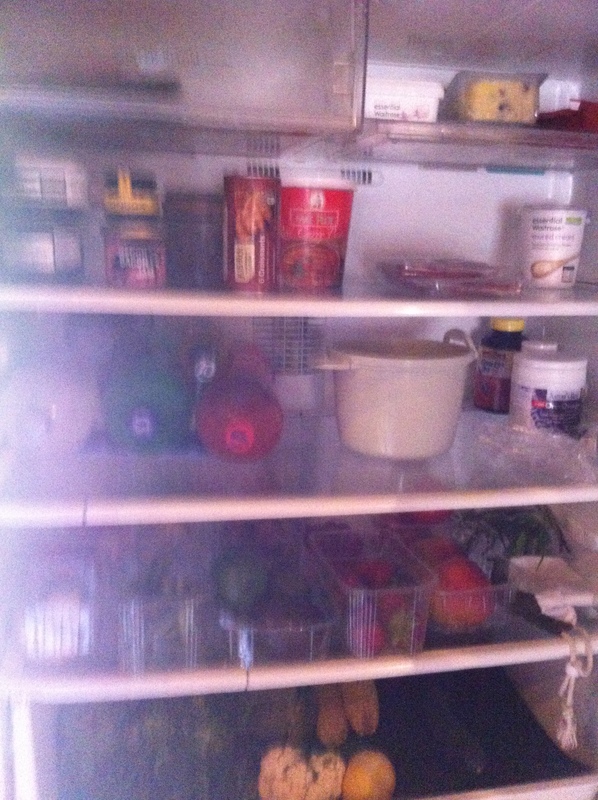 And this is what our fridge looks like now. Yes I know there are still some foil covered bowls. One is the last of the brandy butter and my life is not worth living if I don’t keep that, but I know it will go. The other is the meat from the remains of a game pie I made which I am keeping to pill Meg (an elderly springer spaniel not my daughter – she has six tablets twice a day and it can be a bit of a challenge persuading her to take them). Oh and you know those little plastic punnets that you get with soft fruit? I keep them and use them to hold little things like garlic, chillies, ginger, cherry tomatoes, shallots etc. It stops them rolling around in the vegetable drawer and means I can see exactly how much I have left of anything. usually clean the fridge once a week, but with anything up to five teenagers plus extras I have been filling it as fast as I can just trying to keep up. However, we are about to go on holiday so it needs to be eaten down and furthermore, in the interests of genuine decluttering I think it is time to get rid of some of the things that have been there far too long. Yes Mr Candied Chestnuts of Cyprus. You are on the way out. Apologies for rubbish photos, camera battery on charge and phone clearly not up to the job today. This is the after photo. I would like to say in my defence that we never usually have any pop in the house as none of us like it. But the Dancer has just completed her expedition for her Gold Duke of Edinburgh Award. 20km a day for 4 days in average heat of 27 degrees. She has also fed the entire local mosquito and midge population. I picked her and two friends up from Cow Green Reservoir last night. “Bring Pop” was her plaintive cry. I wasn’t sure if they were going to drink it or wear it. I beg the plastic trays from friends who use the supermarket as I find the perfect for separating out the smaller veg and fruit. It’s a really good way of storing tomatoes as it protects them from being squashed. I’ve had these (and some spares) for over a year. Fruit juice is an issue. We get through loads, and whilst I do squeeze quite a lot myself and we get gallons from our own apples I can’t find any other way of buying juice except cartons. We use them as firelighter in the winter and they make great trays for seeds but that still leaves quite a few left over. Milk is another issue. The milkman doesn’t deliver to us as we are too far out. Although he has offered to deliver our milk to the castle in the village and we could pick up from there. I think he has juice in glass bottles too. Also NZ Eco Chick suggests powdered milk. Anyone else tried that? The chickens and geese will be happy!